Heavily focused on email pitching. A good read on pitching the med ia, I found it interesting that Ed focused so heavily on email pitching – I’ve read many, many blogs on the subject of email vs phone pitching and I think it’s safe to say that at least in NZ the verdict is still out. As a slight digression this is one of the best blog posts I’ve read on the subject of pitching: Why bad PR is killing all the fluffy kittens. 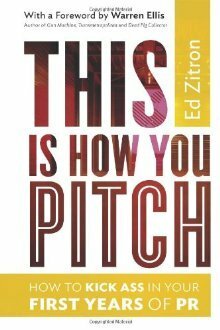 Back to Ed’s book: no nonsense and some good ideas in there if your looking for the basics on pitching. Also for a fascinating insight into how this world of media relations can go horribly askew – check out Ryan Hoilday’s Confessions of Media Manipulator over here.